Im looking to upgrade my breaks on my s2. What is the preffered route of choice to go down? Lots of options if you are running 15" e.g. AP Racing, Wilwood, HiSpec, etc. The most popular is probably the Brembos off the 406 Coupe. At 14" there are some hard to get hold of AP Racing callipers for the 106 or you are looking at a setup off another Peugeot like the 266mm setup (search on here). Thanks for the reply Cris. I can get a set of brembos from the 406 from a friend. Would the disks be a direct fit too? The Brembos are quite heavy from memory, but if they are at agood price and in good condition worth a try. Can`t comment on what discs are needed, but have a search on the forum and I'm sure you'll find out. Theres another popular upgrade to 266mm discs, using calipers, carriers and discs from most 307's, 206's and a host of other Pug/Cit cars. These will fit under steels, just be careful where the wheel weights are. For after market, Willwood have some good options, but depends on wheel size, normally 15's are needed. Last edited by Gus; 18-03-2017 at 08:31 PM. 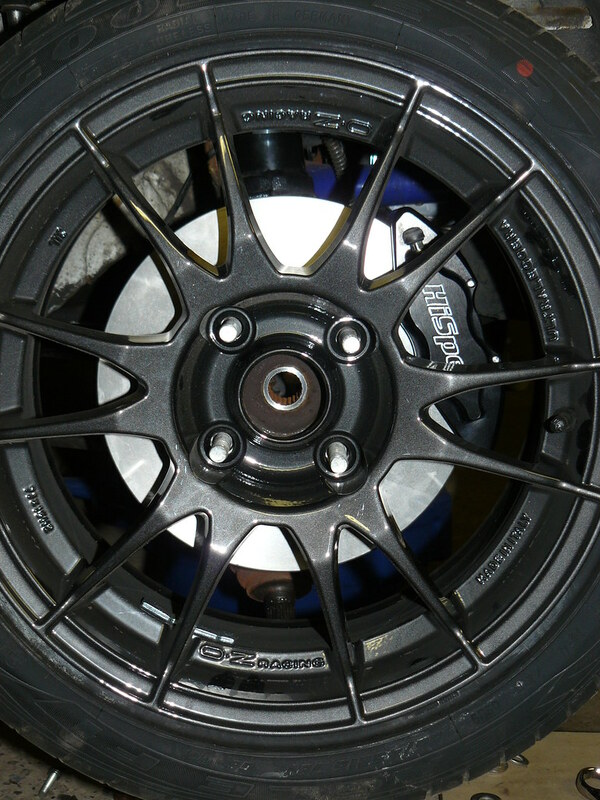 283x26 off a 206 RC,and the calipers are pretty light,they weigh 2,8kg each,need 15" wheels though. Unless you are on track with decent tyres I would stick with a good standard set-up. This includes good quality fluid, braided lines, well bled system, good quality pads (personal preference) and of course quality discs. The best setup in my opinion was that HiSpec kit that Marc Boni developed based off the Lotus Calipers. The problem with the standard cast steel brakes is the weight. A pair of calipers is 7.25kg and the 247mm discs are the same. Unfortunately Marc stopped sourcing them because he found that the caliper was flexing under heavy use causing un-even pad wear. nah, best is the AP setup. not hard to get hold of, but AP never make many batches and its pot luck when they make more. Godspeed brakes did some for my friend Dan, I have 290mm alcons for a heavier car, AP do a similar setup. Yes the APs are arguably the best, but the upfront and running costs are higher. running costs aren't any higher, pad shape for the ap's is a common one so they are cheap. I agree with Mike also. No need to spend more cash if you have no plan to go to the track.